Each year, I make something from the kitchen that “fools” the family. I know, I am SUCH an original. This year was going to be faux fries made from a plain and simple pound cake recipe with faux ketchup (red icing). I was in the middle of making the Ina Garten pound cake, when I realized I was actually making two pound cakes. No, I never, ever, and I mean EVER read the entire recipe beforehand…bad idea…do what I say and not what I do…Ok? Good. When I realized that I had an extra pound cake to be spontaneous with, I knew right away what I was craving and what I had sitting in front of me, jumping up and down waiting to be thrown into the mix. I had a big bag of gorgeous looking, and even more gorgeous tasting, organic CA oranges so yep, orange zest was definitely going to play a role. Next, I plucked a few thyme sprigs from one of the two herbs that survived the harsh So. Cal. winter (kindly note sarcasm) and finally, what goes better with orange flavor and a butter cake than 70% bittersweet chocolate chips? Nothing. Am I right? Challah no, wait, I think it’s halla! and has now been corrected to holla. I never have used that word, but thought I would give it a go. When I went to Google to find out how to spell it correctly because I am just that nerdy, I was told by Urban Dictionary that only “douches” use the word; by the roll of my 16 yr. old’s eyes when I asked him how to spell it, I think I have positively confirmed Urban Dictionary’s assessment. Uh oh. Anyhow, rambling further on…back to the mind altering pound cake. 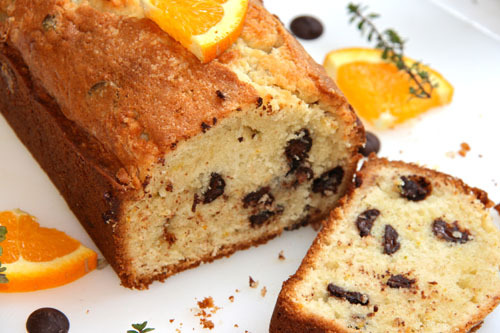 I have not been able to stop pinching a bite here and there of this alluring citrus-y, chocolate chip pound cake. The pound cake is all Ina: buttery, soft yet firm, moist, golden…need I say more? But the bling is all me, and it’s the bling that sends it to Crazy Place. A place you cannot stay away from if you are even a teensy bit off kilter which we have established about me in, oh, about 50 posts or so. I am a sworn chocoholic, and I am sure every other of my posts tells you how one flavor or another is the “perfect accompaniment” or “better half” to chocolate. I recall peanut butter, dark cherry, raspberry, coffee, malt, strawberry, almond and now, here we have it, the latest addition to the all inclusive and ever stretching “What goes smashingly with chocolate” list…ORANGE. TA DA! I know, it is not new news, but it still a superb partner to chocolate nevertheless. So, I had better stop while I am behind and tell you if you need a quick ticket to Crazy Place, make this cake. Your eyes may roll back a bit when you take your first bite and you may feel like you have totally lost your marbles as you quickly grab another slice…and then another, but sanity is highly overrated. Am I right? Holla! From Ina Garten’s Pound Cake —If you refrigerate it for a couple of hours, it’s easier to cut into crisp looking fries so plan ahead! *For the chocolate orange zested pound cake with thyme, just add 1 T. freshly grated orange zest (orange zest only please, no white pith…it’s terribly bitter), 1/4 t. orange extract, 2 t. chopped FRESH thyme and 1/2 c. DARK chocolate chips. Obviously, any chocolate chip would work, but dark is my personal FAVE with orange flavor. Simply add the zest and extract to the buttermilk when you stir in the vanilla. Then, once the mixture is all together, add the chocolate chips at the end and just stir them in. To make the poundcake: Preheat your oven to 350 degrees Fahrenheit and spray coat two loaf pans. 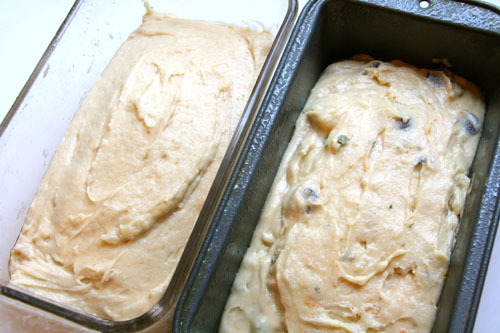 Ina recommends placing a parchment paper, cut to the size of the bottom of the pan, in the loaf pan. I spray coated, put the parchment in, and sprayed the liner as well. 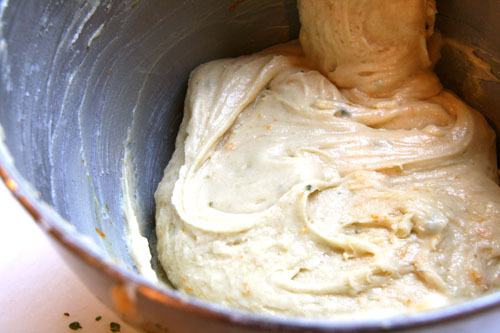 In the bowl of a stand mixer fitted with a paddle attachment, cream together the butter and sugar for about five minutes until creamy and fluffy. 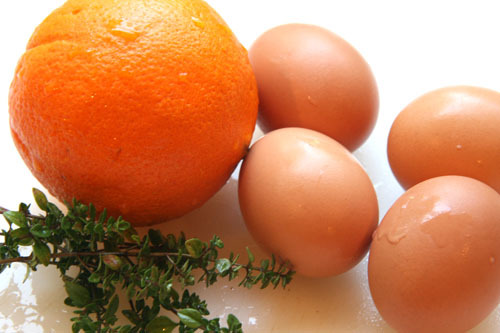 Add one egg at a time, beating in between to incorporate the egg. 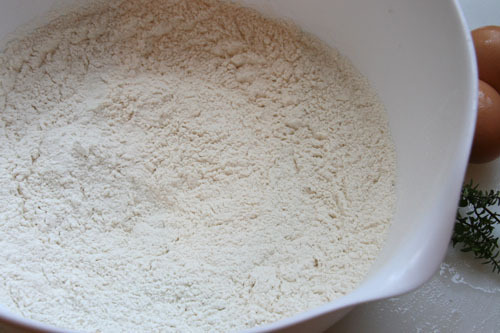 In a separate mixing bowl, whisk together the flour through salt. Stir together the vanilla and buttermilk in a liquid measuring cup. Pour in 1/3 of the dry ingredients and 1/3 of the milk into the butter mixture, creaming together until just incorporated and repeat this process until everything is mixed together but do not over mix. Divide the batter between the two pans and bake for 50-60 minutes or until the top is golden and a toothpick comes out clean. Cool for ten minutes and then release the cake from the pan by taking a butter knife around the outside of the cake to make sure none is sticking to the sides. To make the faux fries (I realized AFTER I had cut up my homemade pound cake, that pictures would hve been helpful to demonstrate how to cut the fries so the one you see there is a frozen Sarah Lee stunt double). Cool the cake COMPLETELY and then refrigerate over night or for at least an hour or so. This will make it firm and easier to cut. The crinkles will make more of an indention the firmer the cake is and therefore they will look more like fries. 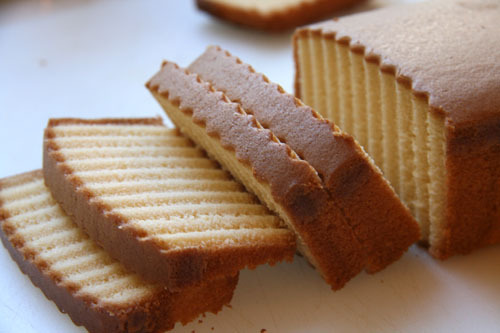 With a crinkle cutter or knife, cut the ends off of each small side/short side of the pound cake, exposing the inside of the cake. You will still have the darker “crust” on for the long sides. 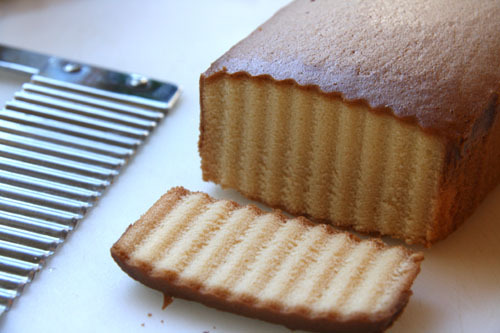 Now, with your crinkle cutter or appropriate knife, cut about 1/2 inch thick slices, just like you would any loaf cake or pound cake. 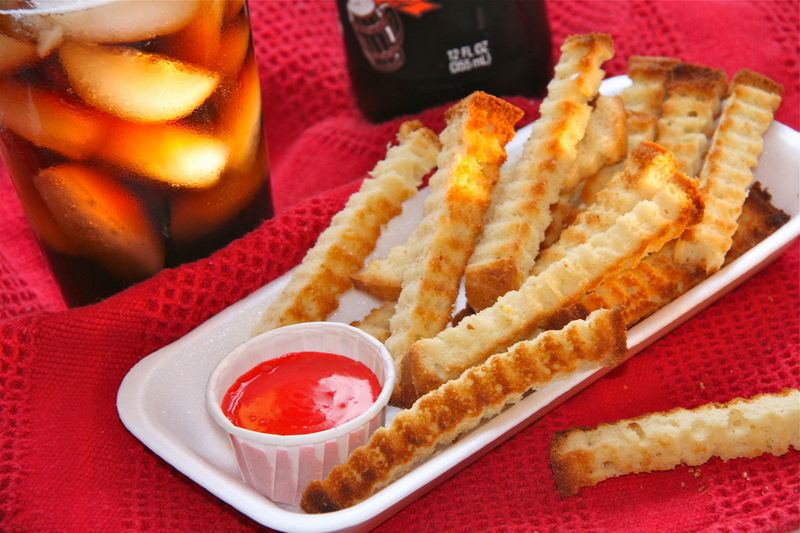 Take each slice and cut it into four fry-like sticks. The brown left from the “crust” on the outside edge will look good on the ends so don’t remove those. Preheat the broiler so it’s nice and hot. 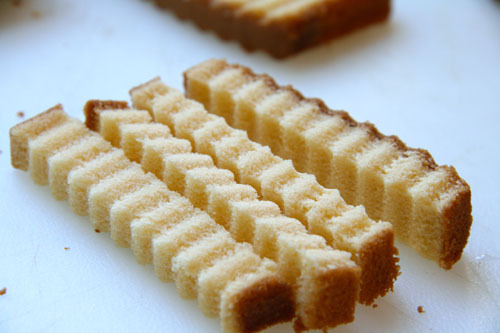 We are going to toast the pound cake sticks now. Finally, lay the pound cake sticks on a cookie sheet in a single layer, and place the cookie sheet in the oven, watching them like a hawk. My broiler cooks unevenly so I turned my pan around to adequately toast the back and front “fries”. Take the pan out and using tongs, carefully turn over each “fry” to toast the opposite side. I took ones off as they were getting done and left others on to get more golden. This honestly took only about five minutes even though it sounds annoying. To make the ketchup…measure about 1/4 c. of powdered sugar, add 1-2 teaspoons of milk and stir. If it’s too thin, add a little more sugar, too thick, add the food coloring first and it will likely thin it out enough. Add ample amounts of red food coloring and stir it in until it’s a bright red. I asked our local Fast Food joint for a couple of extra ketchup cups so that I could really get a good fake fries and ketchup look. It worked! Don’t they look pretty real? Good luck and hope you can fool someone at your house. Have a great April Fool’s Day! Oh my kids would be totally fooled if I made this! Lol that is so cool! You totally had me fooled with that first photo. These pound cakes look incredible! This was an amazing piece of trickery last time and every bit as fun now, Geni. How very creative of you. These are so adorable – April Food’s Day or not!! This is very cool, Geni. You are so clever…I really thought these were fries when I first looked. 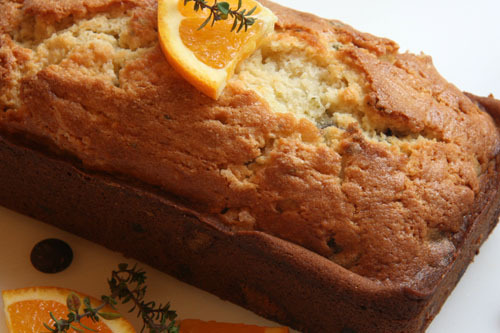 Love the flavors of the thyme, chocolate and orange pound cake version, too! Thank you. They really did fool them which I totally loved.